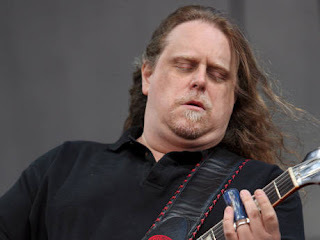 It is of the Warren Haynes Band Live 2 set 2 encore show at the Beacon Theater May 12th 2011. I had the pleasure of catching Warren post Jazzfest with two friends and the show presented was a good time. Nothing earth shattering or mind blowing, but solid and workmen like. I took Tom's line and used it in the review about it feeling like a Clapton show during the 80's (which he insisted was a good thing) and Mattie's overall view that it would have worked better if it was just a Stax cover show. (Both of your royalties checks are in the mail). I think the thread that ties both of those together is that Warren's new songs just aren't all that memorable. He has always been the hardest working man in jamband land, but over the last few years I think he has written so many songs that there is almost a sense of burnout. I felt it starting back in 2004 when he released Deja Voodoo with Gov't Mule and has seeped into his newest solo release, Man in Motion. If one artist didn't need a solo release it is Warren. Maybe I feel that way because I thought his early 00 decade output was some of the best live music out there. The pain of losing his band mate and great friend Allen Woody produced Mule's best moments (all of The Deep End shows and releases) and his venture into Phil and Friends was the spark that reignited The Dead's catalog as he formed the insanely talented Phil Lesh Quintet before helping "The Dead" proper out with some fantastic tours. Anyway, I love his voice and his playing, this wasn't the best show I have seen him do, and it wasn't the worst, so check out some live clips of him with his new band or even better, go check them out live yourself.